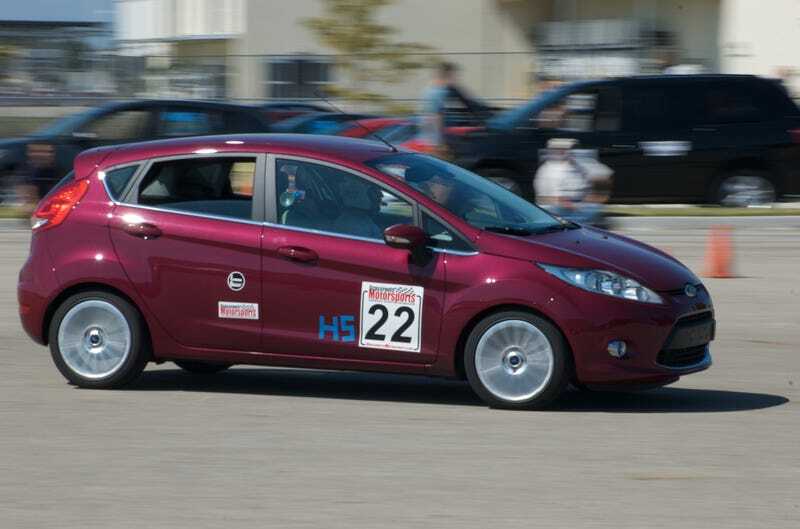 The Ford Fiesta, a popular choice among budget-minded enthusiasts looking for a fun ride that provides both practicality and fuel economy, has been banned from participating in the SCCA's autocross program within the Street Category. According to the SCCA's January edition of Fastrack News, the base Fiesta presents a rollover risk while on course. The Ford Fiesta ST meets the Rollover Potential Guidelines in 3.1. The 2011+ non-ST Fiesta models do not meet the requirements and are to be removed from the HS listing. This comes as a shock to me because the base Fiesta is a great handling car that doesn't seem to present much of a risk. Many people across the nation use base Fiestas to compete in their local regions, it will be very disappointing for them to hear this news. The Fiesta joins the Dodge Caliber, Fiat 500, GEO Tracker, Suzuki Sidekick, Jeep CJ Series, MINI Countryman, Nissan Juke, Suzuki Samurai, Scion xB (04-06), and Scion iQ on the list of cars banned from competing in the SCCA's Street Category. The complete SCCA Solo Rules can be found here. UPDATE: commenter Spoolpigeon has provided a video of a Fiesta ST(!) two-wheeling during a run.